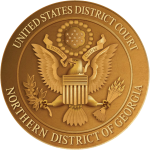 The Northern District of Georgia takes “no show” jurors very seriously. You will be sent a letter to show cause as to why you did not appear. If we do not hear from you, an order will be issued requiring you to appear at a hearing and explain before a judge the reason you failed to appear. The ultimate penalty could be a $1000 fine, three days in jail, community service, or a combination of all three.